The red zone shows roughly how far you can commute with a 36V 15AH battery (Big Bear / Krieger / Big Bear LS / Santana CD), the green zone with a 36V 13AH battery (Gale / Rio MTB / Petite / Santana2) and the blue zone with a 36V 8AH battery (Gallego). This tool can also check for steepness of hills in the surrounding areas and recommend suitable bikes. Just enter your postcode or address and click GO! You can also locate your destination on the map and click it with your mouse - you can zoom in/out on the map or drag the route if you need to. To reset your screen, click GO again. Click on the closest option in each box. Firstly, choose your style: crossbar, stepthrough, folding or sport. 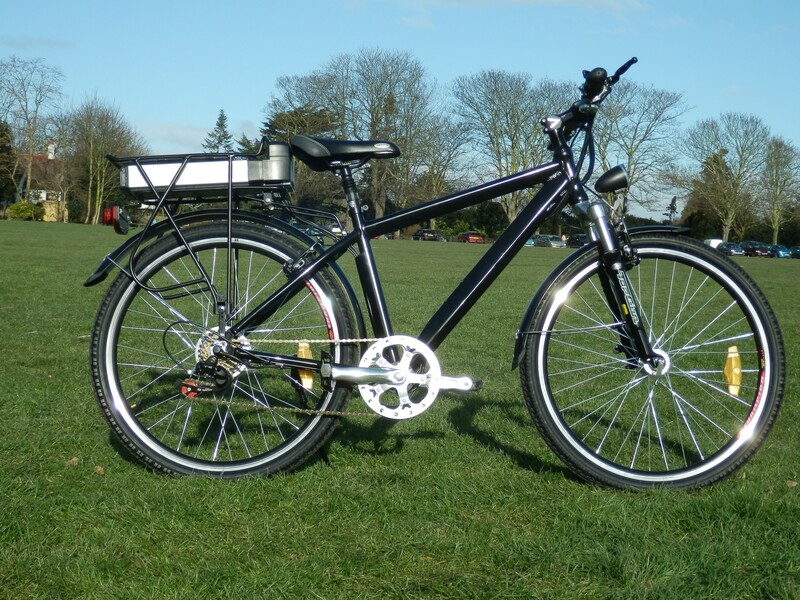 Our crossbar bikes have a high saddle and most models have the battery in the rear. You will have to swing your leg right over these to get onto the bike. Get someone to hold a broomstick 30 inches off the floor and swing your leg over to see how you manage. If you are not so nimble anymore or have problems with knees or hips you should consider a stepthrough. Again, if you have back problems and want to ride on long journeys you might be better with a step through bike. Our step through bikes are easy to get on and have comfortable Dutch style handlebars which keep your back upright. We now sell as many to men as to women. For ladies who prefer a crossbar model, we would suggest the Sport which is light, easy to manage and has the bottle battery, making the leg swing much shorter. Folding bikes are great for shortish trips (under 15 miles return). Not suitable for longer journies because they are not as comfortable as full sized road bikes. Next, fine tune for your weight and height. If you still have some choice after this, fine tune with battery size, gears and colour.